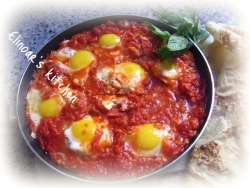 means to shake it :-) Great morning Mizrachi dish, made from tomato and eggs. Great with Iraqi pita. Cut veggies. Warm oil in a big pot, add garlic and the rest of the veggies. Add tomato paste with the water. Upon boiling add eggs, cook for 10 minutes. Easy to prepare and will vanish as quick as can one eat. Shakshuka never lasts long in our home! I like the idea of adding a jalapeno pepper.